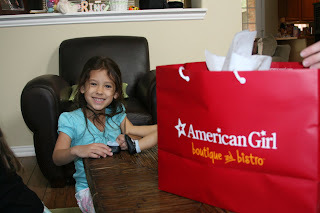 Saturday morning, Joey's mom surprised us girls with brunch at the American Girl Bistro. The kids were thrilled! 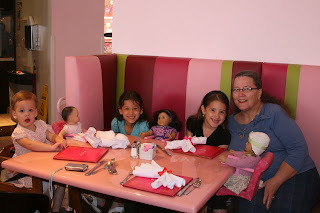 We had never eaten there before and it was so cute to see the kids at the table with their dollies:) The food was delicious and it was just a really fun time. Thanks Nana! Yum! 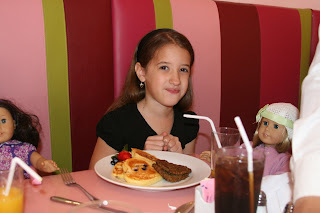 Aubrey & Ella ordered blueberries pancakes, sausage and fresh fruit. They both licked their plates clean. Poor Kit, look at her eyeing Aubrey's food, wishing she was real and could have a bite:) Sorry Kit, you just get to watch us eat-whahahaha! As soon as we got home, the girls were playing with their dolls and all the new doll clothes, shoes and jewelry their Nana & Tata spoiled them with. Ella has changed Ruthie's clothes about fifty times since that shopping trip. Matching outfits, isn't that the cutest? 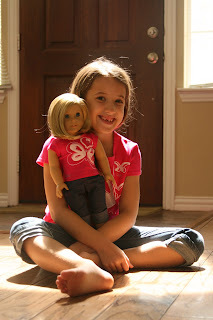 The kids each got shirts to match their dolls shirts. These two pictures are just adorable. Of course, my photographer husband Joey took them(my pics don't ever turn out as good!). 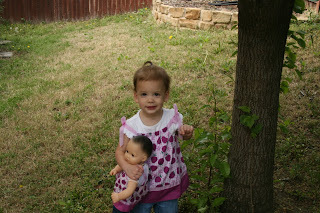 Aubrey just loves her doll soooo much. 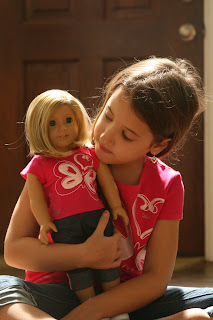 Joey captured that love perfectly. . . . a girl and her doll. . . .so sweet! Very girly and cute. I'm glad you girls had so much fun. What a great grandma and great memories. 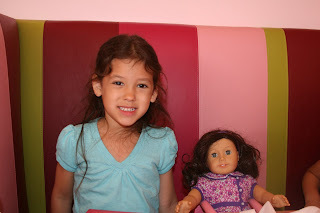 My girls have never gotten in to American dolls, but that picture of Aubrey with her doll turned out so cute that it makes me think maybe they should. 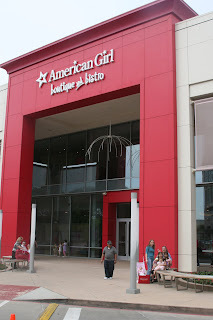 I always wanted an American Girl doll when I was growing up. Your girls are so lucky! 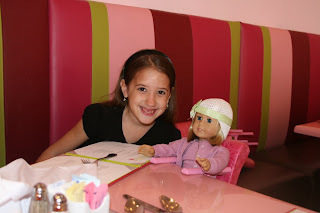 I loved seeing the pictures of them enjoying themselves with their nana and at the Bistro. What fun! Oh, tons of fun! What a great girls' getaway! What wonderful memories you are sharing with your girls..
You lucky people for having one of those. That is just plain cute. I love the colors and the atmosphere so much. Look how fun. Joey is hilarious. He does make a cute American girl. Happy day and thanks for sharing. I loved the picture of Joe front and center of the picture! lol Quite the model, indeed. And I wish I'd had one of those dolls as a kid, they're very lucky to have them. 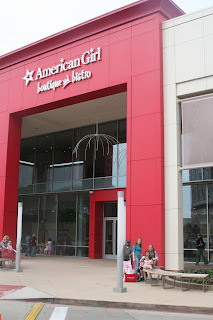 american girl company/restaurant sure know how to do things right. i enjoyed the experiences i had there with my girls in new york. This is a dream of mine. 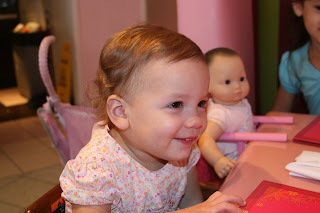 However, I have not had a daughter into the dolls enough. I am crossing my fingers on the Emster. How fun! Looks like the girls had a great time. What a fun activity! I want a grandma like that! I didn't even know they had a restaurant. That is so cute! What a fun outing! I've never heard of that place (probably because I have sons and not daughters). Yeah for grandparents! They are the best! How cool!! I did not even realize such a place existed! I need a girl!! What fun times!! I love the matching outfits, that is ultra smart on the store's part!